What makes the East Windsor PAL Little League GREAT? 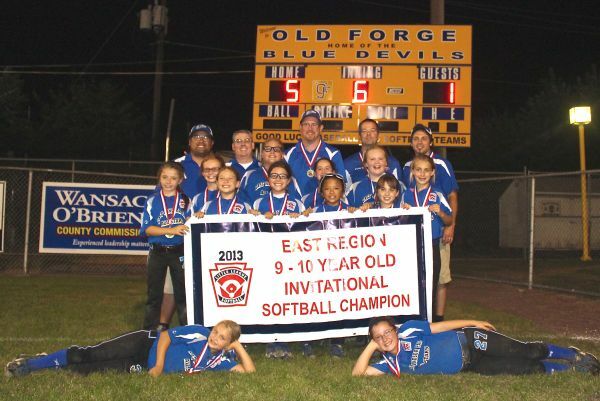 Congratulations to the East Windsor PAL 9-10 Softball All-Stars on winning the 2013 Eastern Regional Championship in Old Forge, PA. The team went 5-0 in the tournament, scoring 50 runs and allowing 8. Congratulations to the East Windsor PAL 9-10 Softball All-Stars on winning the 2013 New Jersey State Championship in Hoboken. The team went 3-0 in the tournament, scoring 33 runs while allowing only 3. The team is now playing in the Eastern Regional Tournament in Old Forge, PA. They are 4-0 in the tournament and playing in the finals on Wednesday vs. Connecticut. Good luck TEAM NEW JERSEY! Congratulations to the East Windsor PAL 9-10 Softball All-Stars for winning the 2013 NJ Section 3 Championship. The team went 3-0 in the tournament, scoring 40 runs and allowing zero. Congratulations to the East Windsor PAL 9-10 Softball All-Stars for winning the 2013 District 12 Championship. The team went 4-0 in the tournament, scoring 31 runs while allowing only 1.